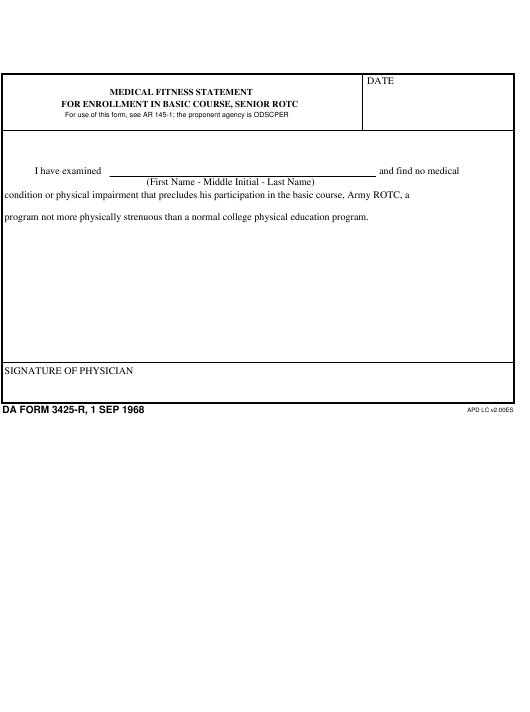 DA Form 3425-R - also known as the "Medical Fitness Statement For Enrollment In Basic Course, Senior Rotc" - is a United States Military form issued by the Department of the Army. The form - often mistakenly referred to as the DD form 3425-R - was last revised on September 1, 1968. Download an up-to-date fillable PDF version of the DA 3425-R down below or look it up on the Army Publishing Directorate website. program not more physically strenuous than a normal college physical education program.